Thus spake Miles Raymond in Alexander Payne’s bacchanalian road movie Sideways, when asked what was the deal with Pinot Noir. Last weekend, just for the fun of it – and in hopes of finding some of those haunting, brilliant, thrilling, subtle flavo(u)rs – we finally got around to a long-mooted PN tasting. We alerted a bunch of Pinot-loving friends and asked each to bring a sample bottle from somewhere in the world – anywhere, just something they liked and thought might shine. All the bottles would be clothed in foil and then we’d get sniffing and slurping. Twelve of us assembled around the table faced with an array of glasses, several spitoons (not, it must be admitted, over-used) and 6 Pinots to taste, in 2 flights. Then the work began. I thought I’d be left with everyone’s scribbled notes, but in the event can only find mine. I had Number 1 down as ‘recognisably Pinot’, fairly light in colour and extraction, quite astringent (green?). Number 2 was also lightish, lively, with good Pinot aromas. Number 3 was noticeably darker than the other 2, initially quite dumb on the nose, but opened up as the evening wore on. 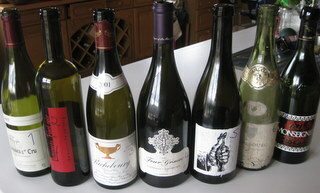 Number 4 was a big wine, noticeably oaky and rich (“New World?”), Number 5 pretty, discreetly oaked and Pinot-true. Number 6 was a pale shadow of what it had clearly once been, not corked but definitely oxidised/brownish and cloudy (should’ve been allowed a rest after its journey from someone’s cellar and decanted). We set it aside and pulled in a wild card, Number 7 – simple, a little oaky. The stars of the evening? The tasters, who all did a grand job (c’mon guys, send me your notes…) And of the wines, the one that stole the show wasn’t actually part of the tasting at all but was uncorked later to go with a rich selection of Swiss and French cheeses – Fritz Wassmer’s Spätburgunder ‘M’ 2007 – excellent value for money at 14.50 euros (we scurried off up there next day and bought more). As for me, I came away with renewed respect for the folks who do this kind of thing professionally – uncorking bottles, pouring them into the correct glass without spilling and keeping track of which bottle was which, proved to be a challenge (for this amateur, anyway). Everyone declared they’d had a good time and learnt a lot (though quite what, no-one was saying). Would we do it again? Definitely – at someone else’s house, and with a different grape variety. Good fun though.